PMT Digital offer acrylic printing to the highest quality. Acrylic printing is a method used to print images directly onto acrylic sheets. Using process 4 colour printing with our unique white print technology, the effect is stunning. Printing white with the 4 colour process enables us to offer direct prints for acrylic, wood printing and coloured foam PVC by adding a base layer of white ink under the image. This means the colour reproduction will be as vibrant as seen on screen and not a tint or faded wash of the background. Spot white printing is another effective visual effect for the designer who is looking for that extra edge. Acrylic printing produces images that are vibrant and sharp from edge to edge with a high definition finish. Polished edges add to the contemporary look. 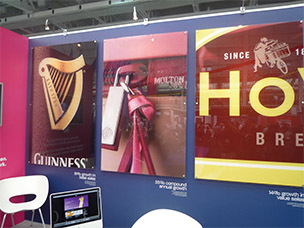 Ideally used for museum graphics, exhibition displays and wall display in a home or business environment. Please contact us on 01480 493666 for further details.